Now, this workout really made me feel awesome all over, not sure whether I was just having a good day or whether it’s the combination of exercises, but I’m still buzzzzzing! 3 sets of 2 exercises executed 5 times for x amount of rounds. 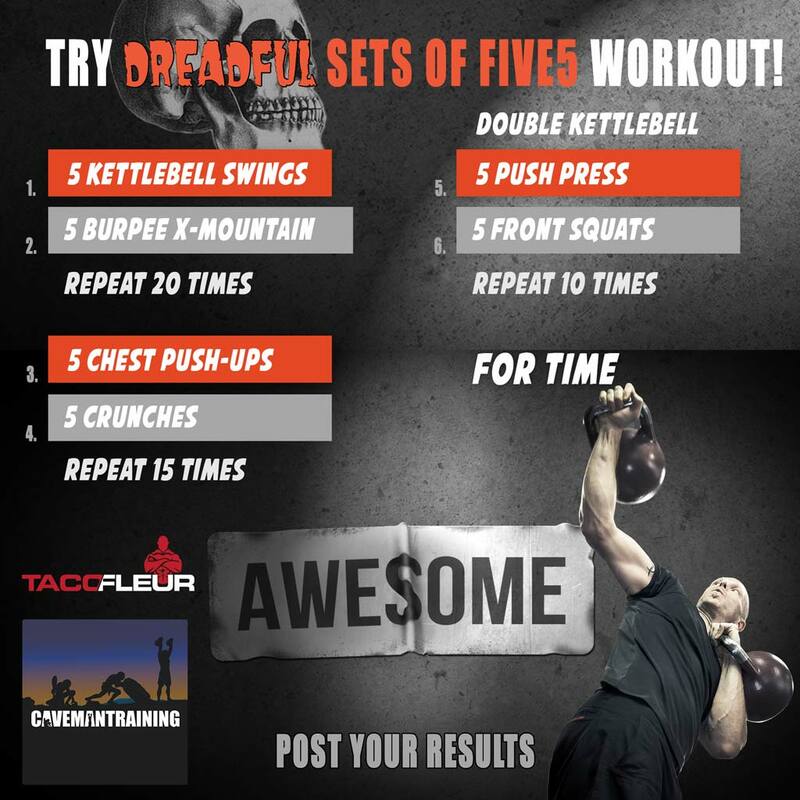 You can save and share the image at the bottom of this post which has the workout on it. This Caveman WOD is for time, you need a good warm-up before you start this WOD. I put out a video for the Kettlebell Swing, check it out The Kettlebell Swing Explained ✔ By CrossFit Level 1 Trainer. I have a tutorial about burpees which will change your mind about burpees and the way you’ve been doing them, but that’s for later ? Just a few quick tips on this one, for the burpee you put your hands under your shoulders and kick the legs out into a plank position, then you perform 1 cross mountain climber, right knee, left elbow, left knee, right elbow, and get back up. Elbows 90 degrees if you want to work the chest more in the CHEST push-ups! This full body workout/WOD will give you that nice buzz you’re looking for! Better than drugs! Try it and let me know if you have questions or feedback. My time for this WOD was 27:46 with 14kg for Swings, and 2 times 14kg for the 3rd set. Yes, could have gone heavier, but this was my second WOD for the day. Every WOD I write, I do it… And of course I went #SHIRTLESS for this one. Remember to join our Shirtless Movement, a workout without a shirt is always a good workout! If you have any questions, feel free to post them below. If you do this workout, post your results below. We’d really like to hear from you, if we hear from you then we know our work of posting workouts publicly is appreciated, if we don’t hear from anyone, then at some stage we’ll go “why put them up for free?”. Read about safety while performing high and fast reps competitive exercise. Read it before? Read it again.